Happy birthday, Kirk Douglas! The actor, producer, director and author turned 102 on Sunday — a famous member of the growing ranks of centenarians in the U.S. and around the world. "Happy 102nd birthday to the most beautiful man. We love you Kirk," wrote Catherine Zeta-Jones, his daughter-in-law, on Instagram, where she posted a photo montage of the star with his family over the years. The young girl playing Christina Aguilera's song "Beautiful" in the video may be Carys Douglas, Zeta-Jones' daughter with Michael Douglas and Kirk's granddaughter, who is now 15. Carys posted her own tribute to her "pappy" on Instagram, writing, "I can't put into words how much you mean to me." 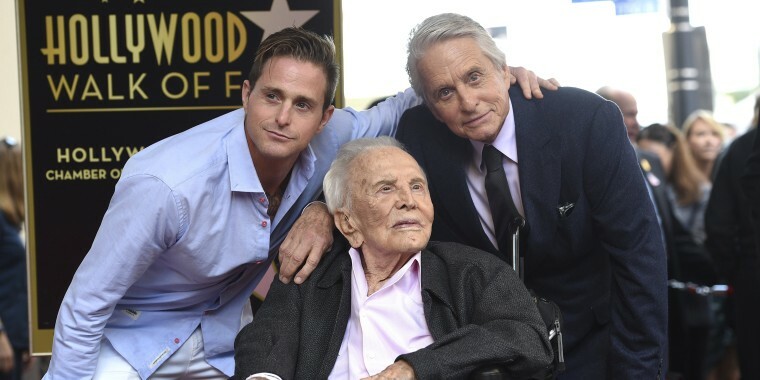 The stroke survivor and centenarian is still out and about: He was at his son Michael's side last month when the actor received a star on the Hollywood Walk of Fame. "It means so much to me, Dad, that you're here today," Michael Douglas said. "I thank you for your advice, for your inspiration, and I'll say it simply and with all my heart: I'm so proud to be your son." Why do some people live so much longer than others? Even if there's no one elixir that will let you live to 100, a surprising amount of power to age well rests in your hands. What can you do right now to boost your longevity? We asked Howard S. Friedman, a psychology professor at the University of California, and Leslie R. Martin, a psychology professor at LaSierra University, both in Riverside, California. They’re the authors of “The Longevity Project,” which showcased a study that followed 1,500 Americans over 80 years and focused on why some people lived so much longer than others. Friedman and Martin found the healthiest people were those who lived meaningful, committed lives: They worked hard, achieved much for their families, nurtured close relationships and were very persistent, responsible and conscientious. Rather than focusing on “yogurt, meditation, vitamins and spas,” they were dedicated to things and people beyond themselves, Friedman told TODAY. A huge amount of scientific evidence suggests staying physically active is one of keys to long life, but going to the gym or running in a marathon is not the secret, Friedman and Martin said. To achieve good health and live a long life, many people think they should take it easy, avoid working too hard and take lots of vacations, but the researchers discovered the opposite was true. “Those who worked hard and accomplished much — the responsible and successful achievers — thrived in many ways,” Friedman said. It is a common misconception that every day stress is bad and that worrying is unhealthy, Friedman and Martin noted. But note that chronic physiological disturbance is not the same thing as hard work, social challenges or demanding careers. Take a hard look at your situation: Having challenging work in a supportive environment and with access to the appropriate tools can be very healthy. But if you are trapped in a hostile work environment with limited ability to do your job well, it may be time to look elsewhere, the researchers said. When it came to staying young, what mattered was staying active not only physically, but also in the social aspects of life: Being in contact with supportive family members or partners, doing things with friends and helping others, whether at work or in volunteer activities, Friedman and Martin said. People in stable, fulfilling marriages tend to be healthier. In the study, men generally thrived in long-term marriages, while marriage was healthy for those women who could find a devoted, supportive husband. “But many women who simply got rid of their husbands from a poor marriage and then stayed single did well. This was also true of women who were widowed… even though the reverse wasn’t true,” Friedman noted. One of the best ways to get on a healthy pathway is to be around other healthy, active, involved people, the researchers said. Join social groups and take part in outings that will lead you to other healthy activities.